RideOnTrack has a full range of gateway-products. The model and make ordered by Nokia will be used for the connection of analogue telephones along the rail track. 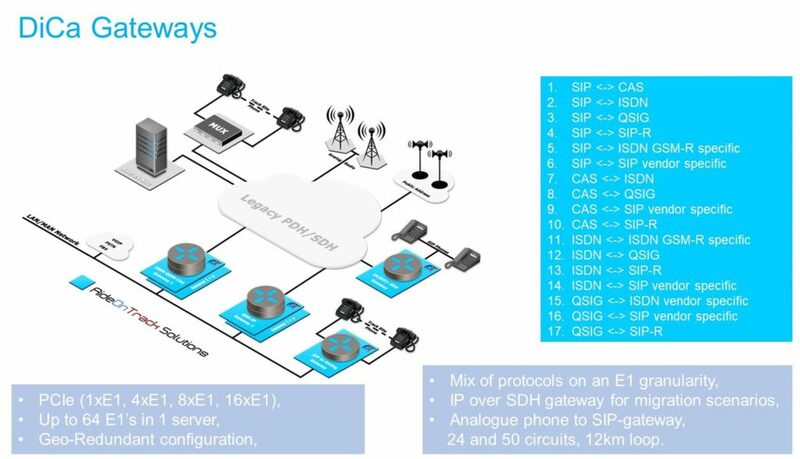 The gateway will allow for the connection of 24 analogue telephone lines and will convert these analogue connections to SIP/IP. The gateways will be connected to the operational IP-network of the railway infrastructure provider. Most European rail operators still have a vast amount of old telephones (local battery- remote battery) installed at crossings, signaling lights, point machines, emergency phones, etc. Often these telephones are still connected by PDH/SDH multiplexers. As most rail operators are migrating their PDH/SDH networks to SIP/IP, the RideOnTrack gateway products are an ideal replacement for this PDH/SDH multiplexers. A very strong selling point for this type of gateway is the amount of analogue circuits that can be terminated on a single box (24 ports or 50 ports) and the ability to drive up to 12km of poor quality copper lines. We are very pleased that we were able to secure this second order from Nokia only 2 weeks after we got our first order for 250 DiCa dispatcher terminals. We believe this shows that RideOnTrack has very interesting products for the fixed operational telecommunication market. And the good news is that we are discussing with Nokia some new business opportunities. 2018 is looking promising.